Keeping things for special. What is it about certain items of clothing that makes us tuck them carefully away in our wardrobe, bringing them out only for 'occasions'? Is it the price we paid for them? The thought that they're 'too dressy'? Something distinctive that makes it obvious when they are re-worn? Or is it an emotional connection to the previous special occasion we've worn them on? This is something I've been thinking about lately, as I've been trying (as always) to use my wardrobe better, and consider Livia Firth's #30Wears campaign in all my purchasing habits. Basically, you ask yourself if you will get 30 wears out of an item of clothing. Simple. Okay, it refers to throwaway fashion but there is a life limit to any garment. I think a lot of people read #30wears as meaning you should wear it 30 times as soon as possible, but this can be unrealistic, unnecessary, and can be just as wasteful. Both you and your garment will quickly grow tired. One of my favourite pieces is my vintage sailor knit top (here's me wearing it 3 years ago). I've owned it for over 10 years but only wear it a few times in the summer. It's well beyond its 30 wears and keeps on giving but it's neither trendy nor a staple basic. I just enjoy it. 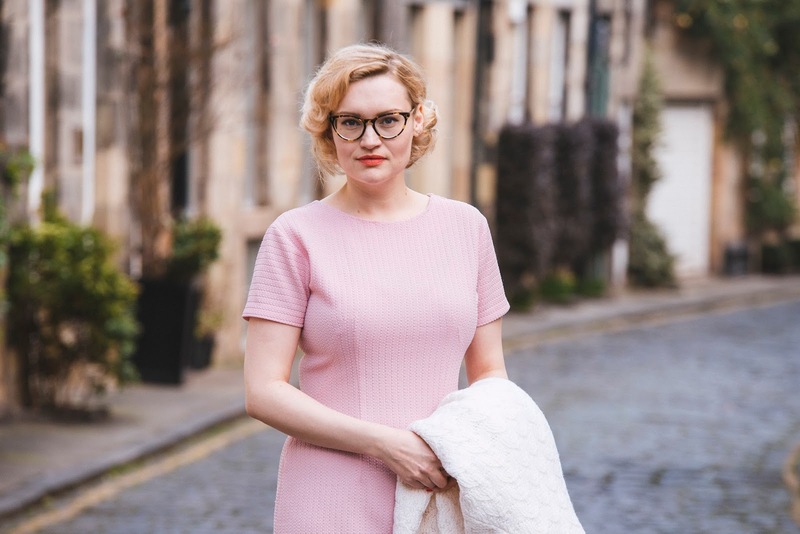 Similarly, I've had the pink vintage dress in these photos for a year now but only brought it out a couple of times. I already know it's a keeper though. And I have plenty of cheap high street pieces I regard the same way. I think my main reason for keeping things for specific opportunities is that the items simply cannot sustain multiple wears and washes. I own many delicate things that are dry clean only, or even wipe clean only. I have a lotta lotta fluff and sequins that give me the fear any time they're in the vicinity of a washing machine. Quite a few of my pieces are samples, one-offs, or from young designers, and the reality is that these are often not the most robust. I've had beautiful samples literally fall apart after a wear or two. I value them as pieces of wearable art but now I'm wondering, should I be? It's the reason I've not worn this 1960's hand knitted coat, which was given to me by an older relative. I'm not sure who made it but it was passed down to her a long time ago. This coat remains precious to her but hadn't seen daylight in decades, carefully wrapped up and locked away from sunlight. She wanted it to be worn, and so she passed it on to me. 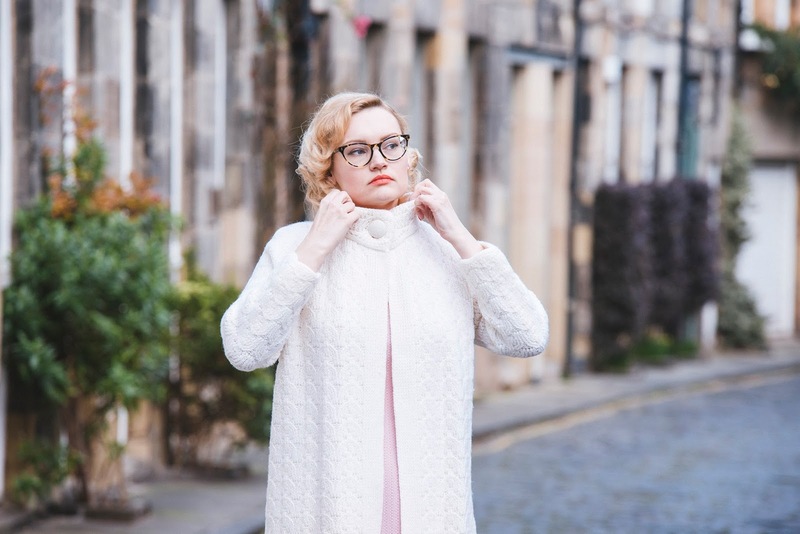 But the fine pattern and the age of the coat has made me treat it with the same kid gloves; I wasn't sure it would survive the dry clean, and it's been carefully kept in a garment bag in my second wardrobe for the Right Time. So why own it at all, if it cannot be used? Arguably, this coat has done its time. It was worn in its first life, and it's outlived most of its peers. It's therefore sustainable. However, it is also for wearing. While I may not want to wear a few on-trend items on repeat for a season, I also need my clothes to work for me. To be clothes. With my wardrobe(s) space at a premium right now, I don't have space for museum pieces. Even as an investment, it's second hand already so what does it matter if it's worn again? I finally thought I'd give it a short outing in this photoshoot with the talented Washington Gwande. And now that I've *gulp* taken it out, and worn it, and even hung it (gently) over a fence during this shoot, I've realised that it's actually made of stronger stuff than I thought. It can be worn! It also fit me beautifully and is quite warm. What have I been doing, hiding it away all these years? Realistically, I know that I'm never going to add this coat into my day-to-day wardrobe. It is still something to take out on an occasion, fancy Queen Mother style or not. However, it's being worn and it's going to continue to be worn, carefully cleaned and stored in-between times. My girl Miss Vicky Viola has some handy tips for keeping vintage clothing correctly. Who knows where it'll end up next! It's great to go through my wardrobe, not looking to throw things out, but looking to give much-loved garments another turn. They deserve it. What do you think? What makes you keep something for special, or makes you decide to take it out? Thanks to Washington Gwande for these dreamy photographs. I have a few pieces in my wardrobe that get kept for special occasions as well. Mainly vintage as well, I'm always worried about wrecking them! p.s you look beyond gorgeous in that dress and coat. I demand to see them in real life one time!